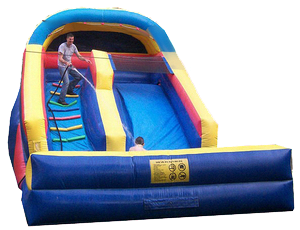 This 16 ft Waterslide is a very big slide and a lot of fun on a hot summer day!!!! This has an inflated pool at end of slide. Front load climbing wall to slide. Recommend 3 kids at a time, one sliding, one climbing and one entering.This unit must be staked or tied off for safety, otherwise water barrels must be ordered.